The new Epiphone Ltd. Ed. Richie Faulkner Flying-V Custom Outfit is the premier signature model from the legendary lead guitarist for Judas Priest. Featuring a classic Flying-V with EMG™ active pickups chosen by Faulkner, a Floyd Rose® Tremolo and bridge and tailpiece with R2 Locking Nut, Grover® Rotomatic machine heads, a Thin-C neck profile, and a custom designed gig bag. When Richie Faulkner joined Judas Priest in 2011, his incredible speed, finesse, and control rejuvenated the pioneering English metal band and helped to introduce them to a new generation of fans. Now as Judas Priest approaches their 50th anniversary, Epiphone welcomes Richie Faulkner to our family of signature guitarists! The new Ltd. Ed. Richie Faulkner Flying-V Custom Outfit is a classic Flying-V with a Mahogany body in an Ebony gloss finish. The Mahogany neck has a Thin-C profile and is modeled after Richie’s favorite vintage Flying-V. Both the body top and headstock have multi-layer Black and Pure White binding. The neck is glued to the body with a traditional deep set joint and has a 24.75 scale length and an Ebony fingerboard with 22 jumbo frets, a 12” radius, and pearloid "Block" inlays along with a “Falcon" logo on 12th fret. 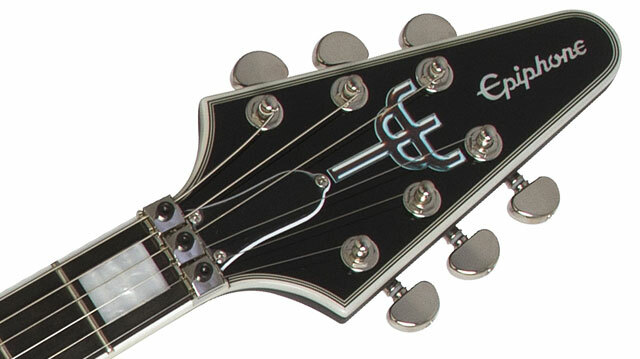 The traditional Flying-V headstock has a 60s era pearloid "Epiphone" logo plus a Judas Priest "Trident" logo. The Floyd Rose "R2" Locking nut (paired with the Floyd Rose® Tremolo bridge and tailpiece) allows for incredibly precise tuning and sustain, a hallmark of Faulkner’s style. For decades, EMG has been the preferred pickups for players who demand high volume, and sensitivity. The Ltd. Ed. Richie Faulkner Flying-V features the classic combo of an EMG-66 (active) humbucker in the neck position and an EMG-57 humbucker (active) in the lead position, both with a Smooth Black Nickel finish. Each pickup uses Alnico V magnets and steel pole pieces for a tonal range and quality reminiscent of the famous “PAF” style humbuckers found in late 50s Les Pauls, but with added headroom, punch, and definition. Controls included an Epiphone all-metal 3-way pickup selector with black toggle cap and a Master Volume (25K) with a Black "Speed" knob. 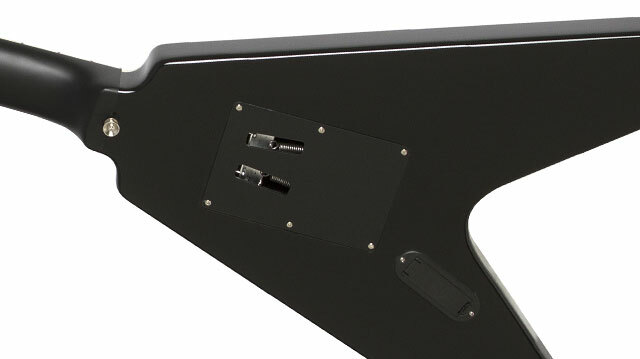 The 9-volt battery compartment for the EMG pickups is easily accessible on the back of the instrument. For years, Richie Faulkner has relied on the legendary Floyd Rose® Tremolo 1000-Series bridge and tailpiece combination (along with the Floyd Rose "R2" Locking nut) for rock solid intonation while blazing over the fretboard. The Richie Faulkner Flying-V includes Epiphone’s rock solid nickel hardware including an Epiphone all-metal 1/4" with metal Jack Plate and Grover® Rotomatic 18:1 ratio machine heads. 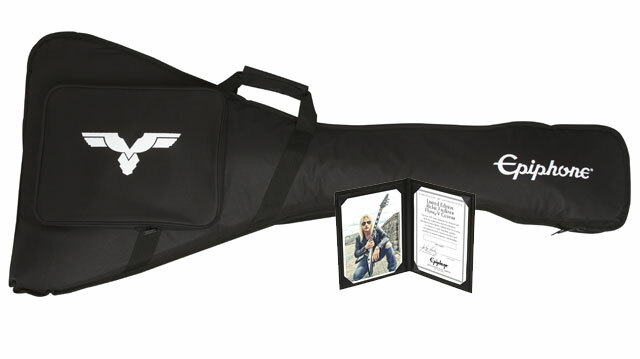 A custom Richie Faulkner deluxe gigbag is included along with a Hand-Signed Certificate of Authenticity in a presentation binder. All Epiphone instruments come with a Limited Lifetime Guarantee and Gibson Brands’ world famous 24/7/365 Customer Service. Supplies are limited! Don’t miss your chance to take home the new Ltd. Ed. Richie Faulkner Flying-V Custom Outfit.